The ability to use organic solvents in enzyme reactions offers a number of industrially useful advantages. However, most enzymes are almost completely inactive in the presence of organic solvents. Thus, organic solvent-tolerant enzymes have potential applications in industrial processes. A chitinase gene from Microbulbifer thermotolerans DAU221 (mtch509) was cloned and expressed in Escherichia coli BL21 (DE3). The molecular weight of the expressed MtCh509 protein was approximately 60 kDa, and it was purified by His-tag affinity chromatography. Enzymatic assays showed that the optimum temperature for MtCh509 chitinase activity was 55 °C, and the enzyme was stable for 2 h at up to 50 °C. The optimum pH for MtCh509 activity was in the sub-acidic range, at pH 4.6 and 5.0. The activity of MtCh509 was maintained in presence of 1 M salt, gradually decreasing at higher concentrations, with residual activity (20%) detected after incubation in 5 M salt. Some organic solvents (benzene, DMSO, hexane, isoamyl alcohol, isopropyl alcohol, and toluene; 10–20%, v/v) increased the reactivity of MtCh509 relative to the aqueous system. When using NAG3, as a substrate, MtCh509 produced NAG2 as the major product, as well as NAG4, demonstrating that MtCh509 has transglycosylation activity. The Km and Vmax values for MtCh509 using colloidal chitin as a substrate were 9.275 mg/mL and 20.4 U/mg, respectively. Thus, MtCh509 could be used in extreme industrial conditions. The results of the hydrolysate analysis and the observed increase in enzyme activity in the presence of organic solvents show that MtCh509 has industrially attractive advantages. This is the first report on an organic solvent-tolerant and transglycosylating chitinase from Microbulbifer species. Chitin is a linear β-1,4-linked homopolymer of N-acetyl-β-d-glucosamine (GlcNAc), the second most abundant biomass on earth after cellulose. Chitin is present in the cell walls of fungi and in the exoskeletons of crustaceans and arthropods. Approximately 1011 tons of chitin is discarded every year [1, 2]. However, chitin is biocompatible, biodegradable, and bioabsorbable . Commercially, chitin is traditionally degraded with concentrated acids or alkalis. However, there are many issues with these processes, including the production of environmental pollution and acidic waste, low yield, and high cost. Enzymatic hydrolysis of chitin could resolve these problems. Therefore, the development of an enzymatic method of chitin degradation is important [4–8]. Chitinases [EC. 3.2.1.14] are hydrolytic enzymes that degrade the glycosidic bonds between chitin polymers. These enzymes belong to glycosyl hydrolase family 18 (GH 18) and 19 (GH 19) with most chitinases in bacteria, fungi, viruses, animals, plants, and other organisms being GH18 enzymes [9, 10]. All GH 18 chitinases have a triosephosphate isomerase fold [TIM (β/α)8 fold] with a conserved DXXDXDXE motif in the catalytic domain. The TIM (β/α)8 fold contains α + β insertion domain that is associated with deepening of the substrate-binding groove . The deepening of the substrate-binding groove influences enzymatic activity, i.e., processivity. In a previous report on processive cellulases, it was shown that processive chitinases have long substrate-binding clefts, or tunnels, as well as substrate-binding clefts [12, 13]. Processive enzymes have increased catalytic efficiency because the detached polymer chains are prevented from reassociating with crystalline material and stay closely associated with polymer chains [12, 14]. Chitinases can be classified as endochitinases or exochitinases. Endochitinases randomly cleave internal sites in the chitin chain and release GlcNAc and chitooligosaccharides, whereas exochitinases or chitobiosidases (EC 3.2.1.29) catalyze the hydrolysis of chitin polymers from the reducing or non-reducing ends and release chitobiose. 1,4-β-N-Acetylglucosaminidases [EC 3.2.1.30] cleave chitobiose and release N-acetylglucosamine [15–17]. Some chitinases have accessory domains, such as chitin-binding domains (ChBDs), fibronectin type III domains (FN3s), and polycystic kidney disease domains (PKDs). These domains help the chitinase cleave polymeric substrates. In addition, some chitinases have transglycosylation (TG) activity. Through TG, the produced chitooligosaccharide moiety can be transferred to a proper acceptor to make a new glycosidic bond. Furthermore, TG allows chitooligosaccharide with a specific degree of polymerization (DP) to be produced . N-Acetylglucosamine and chitooligosaccharides produced via the hydrolase or TG activity of chitinase have useful functions, including as drug delivery carriers, antioxidants, in hemostasis and wound healing, immuno-enhancers and host defense activation, blood cholesterol control, antibacterial agents for food preservation, elicitors, lysozyme inducers, immuno-enhancers, and for natural cancer prevention and treatment [3, 16, 19, 20]. In a previous report, Microbulbifer thermotolerans DAU221 was isolated from the eastern coast of the Republic of Korea, and genomic library of this bacterium was constructed . In this study, we report the characterization of novel chitinase from DAU221. The putative chitinase was cloned, expressed, purified, and characterized, and the results demonstrated that it is a sub-acidic chitinase with transglycosylation activity. The results of this study indicate that the chitinase could be used in extreme industrial conditions. Colloidal chitin was prepared by a modification of the method of Roberts and Selitrennikoff . Briefly, 175 mL of concentrated HCl was carefully poured onto 10 g of crab shell (C9213; Sigma-Aldrich, St. Louis, USA) and stirred at 4 °C for 24 h. Then, 1 L of ice-cold 95% ethanol was added to the mixture and stirred at 4 °C for 12 h. The sediment was harvested by centrifugation at 8000 rpm for 20 min at 4 °C, and the continually washed with sterile distilled water until the acid was neutralized. The Microbulbifer thermotolerans DAU221 strain used in this study was deposited in the Korean Culture Center of Microorganisms (KCCM 43021; 16S rDNA sequence GenBank ID: KC571186). It was cultivated in Marine Broth 2216 (MB; Difco, Detroit, MI, USA). Plasmids pUC118 and pCC1FOS (Epicentre, Madison, WI, USA) and Escherichia coli (E. coli) JM109, EPI300-T1 were used to construct the genomic library and cloning the chitinase gene. The pCold I plasmid vector (TaKaRa, Otsu, Japan) and E. coli BL21 (DE3) cells were used for heterologous expression. M. thermotolerans DAU221 was cultured in MB medium with shaking at 30 °C overnight. E. coli JM109 and BL21 (DE3) were grown in Luria–Bertani (LB) broth at 37 °C. Ampicillin (50 μg/mL) or chloramphenicol (12.5 μg/mL) was added to the LB broth when required. Oligonucleotide primers were purchased from Bioneer (Daejeon, South Korea). Chitooligosaccharides—N-acetylglucosamine (NAG1), chitobiose (NAG2), chitotriose (NAG3), chitotetraose (NAG4), chitopentaose (NAG5), and chitohexaose (NAG6)—were purchased from Seikagaku (Tokyo, Japan). Microbulbifer thermotolerans DAU221 genomic library was constructed. The library was constructed using a fosmid library construction kit (CopyControl Fosmid Library Production Kit; Epicentre) . The genomic library was cultured on LB agar plates containing 0.2% (w/v) colloidal chitin and ampicillin (50 μg/mL) at 37 °C for 5 days. After incubation, colonies with clear halo zones were chosen as chitinase-producing clones. To make the first subclone, HindIII was used to cut out mtch509, which was ligated into pUC118. Then, the chitinase-producing clone was digested with XbaI and ligated into pUC118 to make a second subclone. Both of these had chitinase activity, and the sequences were confirmed. Sequences that are similar to MtCh509 were searched by BLAST (National Center for Biotechnology Information, NCBI). The presence of a signal peptide was investigated using the SignalP 3.0 server (http://www.cbs.dtu.dk/services/SignalP) . MtCh509 was aligned with similar sequences using the ClustalW  and ESPript 3.0 programs . Three-dimensional (3D) structure of MtCh509 was predicted with Protein Homology/analogY Recognition Engine Ver. 2.0 (Phyre2) server (http://www.sbg.bio.ic.ac.uk/phyre/) . To express recombinant MtCh509, E. coli BL21 (DE3) cells containing a recombinant plasmid were incubated in LB broth containing 50 μg/mL ampicillin at 37 °C. When the OD600 reached 0.4–0.5, the cells were incubated on ice for 30 min. Then, IPTG was added to a final concentration of 0.1 M, and incubated at 15 °C for 24 h. The cells were harvested by centrifugation at 6000 rpm for 20 min at 4 °C. The cells were re-suspended with His-tag binding buffer [20 mM sodium phosphate (pH 7.4), 0.5 M NaCl, 5 mM imidazole]. The cells were lysed by an ultrasonicator with 15-s pulse for three times. The lysed cells were centrifuged (13,000 rpm at 4 °C for 10 min), and then the supernatant was collected. The recombinant protein was purified with His-Trap HP column (Amersham Biosciences). The column was equilibrated with His-tag binding buffer, and the collected supernatant was loaded on the column. The bound protein was eluted with His-tag elution buffer [20 mM sodium phosphate (pH 7.4), 0.5 M NaCl, 0.5 M imidazole]. The eluted fractions were passed through an Amicon Ultra-4 filter (Millipore, Bedford, MA, USA), and the buffer was changed to 20 mM sodium phosphate (pH 7.4). Purified protein was quantified by the Bradford method . Bovine serum albumin (BSA) was used to construct a standard calibration curve. The molecular weight of MtCh509 was determined using sodium dodecyl sulfate–polyacrylamide gel electrophoresis (SDS-PAGE) method . The SDS-PAGE gel consisted of a 10% separating gel and a 5% stacking gel. The protein size was estimated using standard protein markers (Elpis-Biotech, Daejeon, Korea). After separating the samples, the gel was stained with 0.05% Coomassie brilliant blue R-250 for 2 h, and then decolorized with de-staining solution (water:methanol:acetic acid glacial = 6:3:1). To detect chitinase activity, the protein sample was diluted in native page buffer and loaded into a gel containing 0.1% glycol chitin. 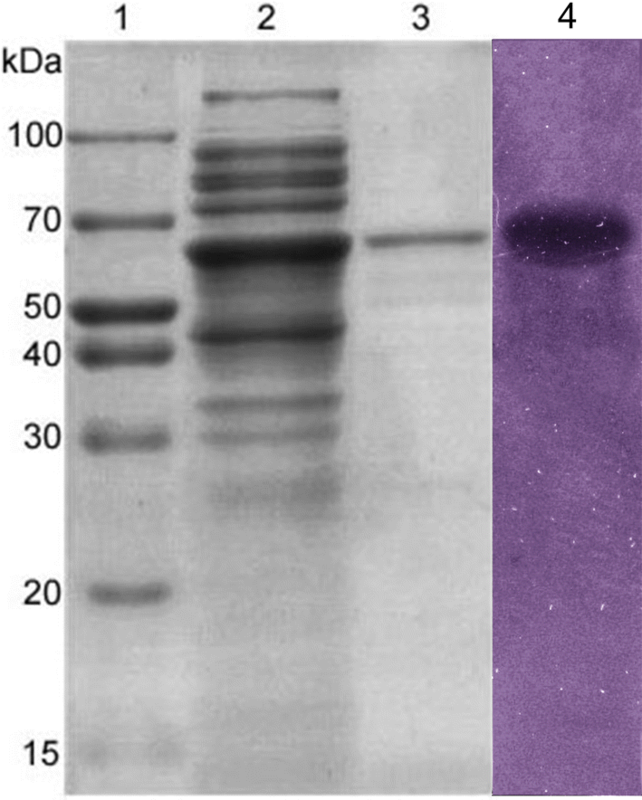 After electrophoresis, the gel was incubated in refolding buffer [50 mM citrate buffer (pH 5.0), 1% Triton X-100] at 50 °C for 4 h. Then, the gel was stained with 0.01% calcofluor white M2R in 50 mM citrate buffer (pH 5.0) for 2 h. The gel was rinsed several times with distilled water for 1 h each and visualized on a UV transilluminator . Chitinase activity was measured using a modified dinitrosalicylic acid (DNS) method . The reaction mixture (total volume, 250 μL) contained 50 mM citrate buffer (pH 5.0), 1% colloidal chitin (100 μL), and 3 μg of purified enzyme. The reaction mixture was incubated at 55 °C for 1 h. After the reaction was complete, DNS (750 μL) was added to the reaction mixture and boiled for 10 min. Then, the mixture was cooled on ice and centrifuged at 13,000 rpm for 1 min. Reducing sugar was measured as the absorbance at 540 nm. One unit of MtCh509 chitinase activity was defined as the amount of enzyme needed to liberate 1 μmol of reducing sugar per minute. NAG2 was used as a standard. To determine the optimum temperature for MtCh509 chitinase activity, chitinase assays were performed at various temperatures (10–80 °C). All other reaction parameters were standard assay conditions. Thermal stability was measured as the residual activity after purified MtCh509 was preincubated at 10–80 °C for 30 min before the assay. For the assay, 1% colloidal chitin was added to the preincubated sample, and the reaction mixture was incubated at the optimum temperature for 1 h. To assess high-temperature stability, the enzyme was preincubated at 40, 50, 55, and 60 °C for up to 4 h and then incubated at the optimum temperature for 1 h.
The optimum pH was determined by performing the assay with a variety of buffers at different pH values (50 mM each): citrate buffer (pH 3.0–6.0), sodium phosphate (pH 6.0–8.0), Tris–HCl (pH 8.0–9.0), and glycine–NaOH (pH 9.0–10.0) at the optimum temperature for 1 h. To determine pH stability, purified MtCh509 was preincubated in the buffers mentioned above for 1 h on ice. After preincubation, 1% colloidal chitin (100 μL) was added to the mixture, which was incubated at the optimum temperature for 1 h.
The effect of metal ions and NaCl was assayed by measuring the residual activity in the presence of each ion or salt. Purified MtCh509 was preincubated with 1, 5, and 10 mM of various metal ions, including Ba2+, Ca2+, Co2+, Cs2+, Cu2+, Fe3+, Hg2+, K+, Li+, Mg2+, Na+, Ni+, and Zn2+, as well as EDTA and dithiothreitol [DTT] for 1 h on ice. Then, to assess residual activity, 1% colloidal chitin was added to the mixture and incubated for 1 h at the optimum temperature and pH. Because EDTA is a metal ion chelator, it was used as a negative control . To determine the effect of salinity on activity, the enzyme was incubated with different concentrations of NaCl (0.5, 1, 1.5, 2, 2.5, 3, 4, and 5 M). Purified MtCh509 mixed with NaCl was placed on ice for 30 min. Then, 1% colloidal chitin was added to the preincubated mixture and incubated under standard assay conditions. The effect of organic solvents on chitinase activity was studied by incubating the enzyme with different solvents, including acetone, butanol, DMSO, ethanol, hexane, isoamyl alcohol, isopropyl alcohol, and methanol. The final concentrations of organic solvents were 10% and 20% (v/v). The reaction mixtures, containing 50 mM citrate buffer (pH 5.0), 1% colloidal chitin, organic solvent, and purified MtCh509, were incubated at 55 °C for 1 h. Then, residual activity was measured by the DNS methods. To determine the substrate specificity of MtCh509, purified MtCh509 was incubated with a variety of substrates under standard assay conditions. The final concentration of each substrate was 1%. The substrates tested were colloidal chitin, glycol chitin, carboxymethyl cellulose (CMC), and Avicel (microcrystalline cellulose). The reducing sugar released in each reaction was measured using the DNS method as mentioned above. The kinetic parameters of MtCh509 chitinase activity were estimated by studying the initial reaction rate of purified MtCh509. Different concentrations of colloidal chitin were used as substrates at final concentration ranges of 2–7 mg/mL. The reaction mixtures were incubated in assay buffer for 10 min. The assay was performed in triplicate. The kinetic constants, Km and Vmax, were estimated by a Lineweaver–Burk plot. Reaction mixtures (25 μL) containing 1% colloidal chitin (10 μL) and 0.3 μL of purified enzyme in 50 mM citrate buffer (pH 5.0) were incubated at 55 °C for various times (0, 1, 15, 30, 60, 180, 360, 540, and 720 min). When chitooligosaccharides (NAG2–NAG6) were used as substrates, the reaction mixtures (10 μL; 50 mM citrate buffer, substrate, and purified MtCh509) were incubated at 55 °C for 1, 5, 10, 15, 30, and 60 min. Then, 1 μL of 0.1 M NaOH was added to stop the reaction. When the reaction was complete, aliquots of the reaction mixtures were separated by TLC on a silica gel plate (Dieselgel 60; Merck, Berlin, Germany) with a solvent system containing n-butanol, methanol, 25% ammonia solution, and water [5:4:2:1 (v:v:v:v)]. The products were detected by spraying the plate with aniline-diphenylamine reagent (4 mL of aniline, 4 g of diphenylamine, 200 mL of acetone, and 30 mL of 85% phosphoric acid) and baking it at 180 °C for 10 min . To identify the major products of chitin hydrolysis by MtCh509, an HPLC analysis was performed. Colloidal chitin was used as substrate. Reaction mixtures (500 μL) containing colloidal chitin, 50 mM citrate buffer (pH 5.0), and 6 μg of MtCh509 were incubated at 55 °C for 12 h. After incubation, the reaction mixture was centrifuged at 13,000 rpm for 10 min at 4 °C. Then, the supernatant was filtered through a 0.22-μm syringe filter. The filtered reaction mixture was injected into HPLC (Waters 1500 series HPLC system) equipped with an Inertsil an HPLC column (4.6 × 250 mm, 5 μm; GL Sciences Inc., Japan). The injection volume was 20 μL. The column temperature was 40 °C. The mobile phase was composed of 70% acetonitrile and 30% MilliQ H2O, and the flow rate was 1 mL/min. ELSD was used as the detector and the carrier gas was nitrogen, which was delivered at 20 psi. The drift temperature was 50 °C. 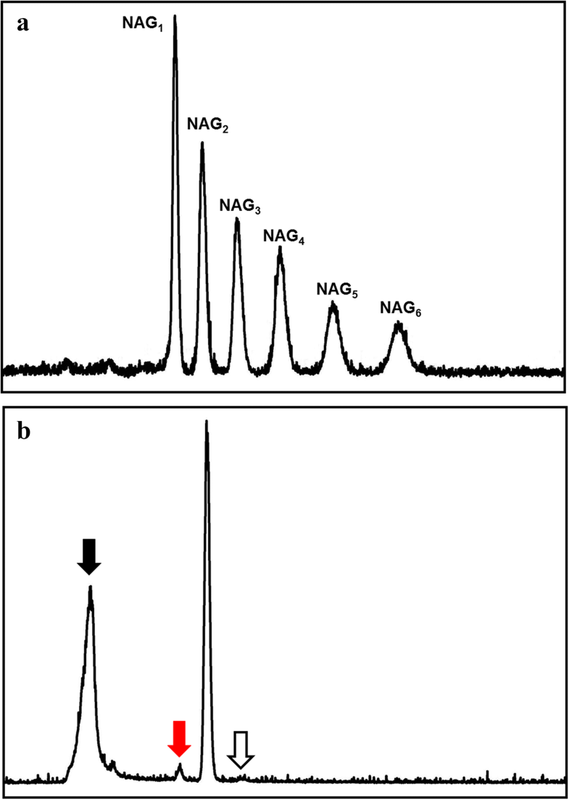 An equal quantity of chitooligosaccharides (NAG1–NAG6) was used to generate standard peaks. Chitin degrading clones identified among the fosmid genomic library of M. thermotolerans DAU221 were isolated on LB-colloidal chitin agar medium and named CH1-CH4. The CH4 clone was selected and subcloned into pUC118 for sequencing, resulting in the identification of the chitinase gene, mtch509, from M. thermotolerans DAU221. The mtch509 gene is 1527 bp and encodes a protein of 509 amino acids. The deduced amino acid sequence of MtCh509 was compared with those of known bacterial chitinases, which were obtained from the NCBI database. The protein with the highest amino acid sequence identity (71%) was a chitinase from Simiduia agarivorans (WP_015046629). The next highest sequence similarity (63%) was to a chitinase from Cellvibrio japonicus (WP_012488573), followed by chitinases from Cellvibrio mixtus (WP_039915554, 60%), Gilvimarinus agarilyticus (WP_041522559, 56%), and Saccharophagus degradans (WP_011468184, 55%). The MtCh509 amino acid sequence contains a glycosyl hydrolase family 18 (GH 18) and chitin-binding domain type 3 (ChtBD3) motifs. The conserved amino acid sequences in the catalytic domain of GH 18 proteins are DXXDXDXE and SXGG, and these sequences are present in MtCh509. In addition, a ChtBD3 motif was also observed to be conserved in MtCh509 (AKWWTQ; Fig. 1). The mtch509 gene was PCR amplified without its signal peptide. The amplicon was cloned into the vector pCold I, such that the resulting plasmid, pCold I-MtCh509, encoded MtCh509 with a 6 histidine tag at the N-terminus. The pCold I-MtCh509 plasmid was transformed in E. coli BL21 (DE3) cells for heterologous protein expression. Cells were incubated with 0.1 M IPTG at 15 °C for 24 h after which the cells were disrupted, and the cell lysate containing MtCh509 was collected. The enzyme was purified by His-tag affinity chromatography. An SDS-PAGE analysis under denaturing conditions showed that the molecular weight of MtCh509 was approximately 60 kDa. The zymogram results showed a clear zone around a single band (Fig. 2). To determine the optimum temperature for the chitinase activity of purified MtCh509, the enzyme was incubated at various temperatures (10–80 °C) for 1 h. Purified MtCh509 showed the highest activity at 55 °C. When the maximal activity was set to 100%, MtCh509 showed ~ 60% activity at 50 °C and 55% activity at 60 °C. When purified MtCh509 was preincubated at 70 °C, the activity decreased sharply to 9% (Fig. 3a). Next, purified MtCh509 was incubated without substrate for 4 h at 40, 50, and 55 °C, and then assayed for chitinase assay. The results showed that the purified MtCh509 was highly stable for 4 h at up to 40 °C. In addition, the enzyme was stable at 50 °C for 2 h (Fig. 3b). The effect of pH on MtCh509 activity was assessed across a broad range of pH values (3.0–10.0) using 1% colloidal chitin as a substrate (Fig. 3c). The maximal MtCh509 activity was observed in 50 mM citrate buffer at pH 4.6 and 5.0. This activity was significantly increased at pH 4.4 with more than 80% activity observed in 50 mM citrate buffer at pH 4.4–6.0. This activity of MtCh509 decreased sharply (to ~ 30%) in 50 mM sodium phosphate buffer at pH 6.0, increasing to ~ 80% at pH 7.0. Under alkaline conditions, the activity of MtCh509 decreased. MtCh509 exhibited more than 60% stability in 50 mM citrate buffer in the sub-acidic range of pH 4.2–6.0. However, the enzyme exhibited relatively low stability under neutral and alkaline conditions. To examine the effects of various metal ions and chemical reagents on MtCh509 activity, the purified recombinant enzyme was preincubated with various metal ions and chemical reagents, including Ni2+, Cu2+, Mg2+, Li+, Ba2+, K+, Zn2+, Mn2+, Ca2+, Co2+, Cs2+, Hg2+, EDTA, and DTT, for 1 h on ice without substrate. The final concentrations of metal ions and chemical reagents were 1, 5, or 10 mM. Subsequently, the residual activity of MtCh509 was estimated using colloidal chitin as a substrate at 55 °C for 1 h. In the presence of 1 mM Ni2+, MtCh509 showed ~ 100% residual activity decreasing stepwise, in the presence of 5 and 10 mM Ni2+. Relatively high activity was maintained in the presence of 5 mM Cu2+, although the activity dropped sharply in the presence of 10 mM Cu2+. When preincubated with Mg2+, the residual activity of MtCh509 was high in the presence of 1 mM Mg2+ and decreased moderately in 5 and 10 mM. MtCh509 activity was maintained at relatively high levels in the presence of 5 mM Li+, Ba2+, and K+ but was moderately inhibited in the presence of 10 mM of these metal ions. Residual activity was relatively high and moderate in the presence of 5 mM Zn2+ and Co2+, respectively, but sharply decreased in the presence of 10 mM of these metals. MtCh509 activity was strongly inhibited at both high and low concentrations of Cs2+, and Hg2+ strongly decreased MtCh509 activity, even at low concentrations. MtCh509 activity was moderately inhibited by 10 mM Ca2+, Mn2+, and DTT, and EDTA insignificantly inhibited activity at all assayed concentrations (Table 1). The effect of NaCl on MtCh509 was assessed in 50 mM citrate buffer (pH 5.0). Briefly, purified MtCh509 was preincubated with various concentrations of NaCl (0.5–5 M) on ice. Next, residual MtCh509 activity was measured at 55 °C for 1 h and was compared to the activity measured under standard assay conditions without a NaCl preincubation. Approximately 100% enzyme activity was retained after a preincubation with up to 1 M NaCl, and MtCh509 activity decreased to ~ 65% and ~ 45% in the presence of 2 M NaCl. The activity of MtCh509 decreased as the concentration of NaCl increased, and ~ 20% activity was observed in the presence of 5 M NaCl (Fig. 4). The effects of solvents on MtCh509 chitinase activity were examined by adding various organic solvents (acetone, butanol, DMSO, ethanol, isoamyl alcohol, isopropyl alcohol, methanol, hexane, benzene, toluene, and acetonitrile) to the standard assay mixture, which was incubated for 1 h at 55 °C. The activity of MtCh509 was strongly inhibited by acetone, ethanol, and isopropyl alcohol. In the presence of butanol, MtCh509 activity was moderately inhibited, and when 10% methanol was added, MtCh509 activity was relatively high. In addition, MtCh509 activity rapidly decreased when a high concentration of methanol (20%) was added. In contrast, MtCh509 activity increased in the presence of DMSO, isoamyl alcohol, hexane, benzene, and toluene to > 100%, and activity reached ~ 200% in the presence of 20% benzene (Table 2). Purified MtCh509 activity was assayed using different substrates with the highest activity observed when glycol chitin was used as a substrate. When colloidal chitin was used as a substrate, MtCh509 activity was slightly lower than that observed with glycol chitin. In the presence of CMC, only weak MtCh509 activity was detected, and no activity was detected with Avicel (Table 3). The kinetic parameters of MtCh509 activity, including Km and Vmax, were determined using a Lineweaver–Burk Plot. The calculated Km and Vmax values were 9.275 mg/mL and 20.4 U/mg, respectively (data not shown). A TLC analysis was performed to identify the hydrolysis products produced by MtCh509 (0.3 μg). The reaction mixture was incubated at 55 °C for various times (1–720 min), and hydrolysate spots were observable after 15 min. The color of the spots increased as time passed. Based on the location of the spots in comparison to the NAG1–6 standard, the primary component of hydrolysate appeared to be NAG2. NAG1 was also produced as the incubation continued, and a small quantity of NAG3 was produced and then disappeared (Fig. 5A). When chitooligosaccharides were used as the substrate, the major product was also NAG2 (Fig. 5B–E). In addition, when more purified MtCh509 (0.6 μg) was used, low amounts of NAG3 were converted to NAG4 (Fig. 5F). This result was not observed when other chitooligosaccharides were used as the substrate (data not shown). A reaction mixture using colloidal chitin as a substrate was incubated for 12 h at 55 °C and the resulting reaction products were analyzed with a Waters 1500 series HPLC system. The six peaks from left to right are NAG1–NAG6 (Fig. 6a). The second chromatogram shows the hydrolysate peaks produced from colloidal chitin (Fig. 6b). The peaks marked with black and empty arrows are citrate buffer and NAG3, respectively, with the latter peak appearing to be weak. The peak marked with the red arrow is NAG1, which is present in small amounts. Because the NAG2 peak in the hydrolysate is the highest, the major product of colloidal chitin hydrolysis is NAG2. In this study, we cloned, expressed, and characterized a chitinase from M. thermotolerans DAU221, MtCh509. M. thermotolerans DAU221 was isolated on the eastern coast of the Republic of Korea , and it was subsequently shown to express various proteins, including a carbohydrate esterase , a maltotriose-producing α-amylase , and an esterase . Recently, the whole genome sequence of DAU221 was completed . In this study, a chitinase from M. thermotolerans DAU221 was studied for the first time. In marine environments, most chitin originates from phytoplankton. Chitin is utilized by native microorganisms as carbon and nitrogen sources and a number of bacteria produce chitinases [35–38]. The products of chitinase-mediated chitin hydrolysis, N-acetylglucosamine and chitooligosaccharides, have multiple applications, including in solutions for environmental problems, as antimicrobial or insecticidal agents for the biocontrol of plant pathogens , and in physiological processes such as nutritional morphogenesis, pathogenesis , parasitism, growth regulation, defense, and immunity [15, 40, 41]. The amino acid sequence of MtCh509 was observed to be similar to that of glycosyl hydrolases from Simiduia agarivorans (71%), Cellvibrio japonicus (63%), Cellvibrio mixtus (60%), Gilvimarinus agarilyticus (56%), and Saccharophagus degradans (55%) (Fig. 1). The catalytic domain of GH18 enzymes (DXXDXDXE) is conserved across bacteria, fungi, and archaea [42–46], and MtCh509 contains these conserved DXXDXDXE and SXGG motifs (Fig. 1). 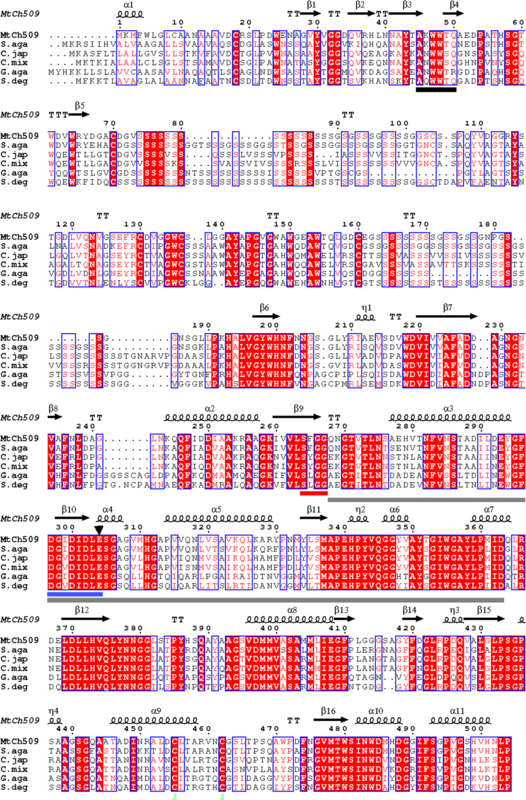 The consensus sequence of the carbohydrate-binding module (CBM5) is AKWWTK in bacteria , and this sequence was observed to be moderately conserved in MtCh509 (A50KWWTQ55) (Fig. 1). CBM5 can bind substrates through hydrophobic interactions between the aromatic residues of the enzyme and sugar molecules of the substrate . MtCh509 belongs to GH family 18, and it has a catalytic domain containing a TIM-barrel (β/α)8 fold. A comparison of the MtCh509 amino acid sequence to those of SpChiA, SpChiB, and SpChiC from Serratia proteamaculans 568  revealed that the α/β fold insertion in MtCh509 was similar to that in SpChiB. SpChiC lacks the α/β fold insertion between β-sheets 7 and 8 in the TIM-barrel fold. The α + β insertion leads to a deepening of the substrate-binding groove in the GH family 18 chitinases , which may improve enzyme processivity. MtCh509 was heterologously expressed and purified from E. coli BL21 (DE3) without its signal peptide (Fig. 2). Temperature and pH are known to have significant effects on enzyme stability and activity . Typically, chitinases have an optimum temperature of 20–50 °C and are stable up to 55 °C [48, 49]. The purified recombinant MtCh509 showed optimal activity at 55 °C in 50 mM citrate buffer (pH 5.0) (Fig. 3), which is similar to that reported for chitinases from Massilia timonae , P. barengoltzii , and B. licheniformis SK-1 . Generally, chitinases are stable at up to 50 °C [52–55], and MtCh509 maintained ~ 100% enzymatic activity at 50 °C for up to 2 h. The activity of MtCh509 was slightly lower at 40 °C, and MtCh509 exhibited ~ 80% activity after incubating for 4 h. MtCh509 activity was moderately decreased when incubated for 2 h at 50 °C, and 50% activity was reached before 4 h (Fig. 3b). A chitinase from Aeromonas veronii, ChiB565, is also stable at up to 50 °C . Purified MtCh509 showed high activity under sub-acidic conditions, with activity dramatically increased at pH 4.4, and maximal activity was observed at pH 4.6 and 5.0 (Fig. 3c). The optimal pH of MtCh509 is comparable to that of the bacterial chitinases from M. timonae (pH 5.0) , Paenibacillus sp. D1 (pH 5.0) , and Sanguibacter sp. (pH 4.6) . Purified MtCh509 was stable at sub-acidic pH values and showed moderate to weak activity under neutral and alkaline conditions. The acidic chitinase from Microbispora sp. showed similar activities. Marine microorganisms are tolerant to high salt concentrations, and salt-resistant enzymes are vital to industrial processes that require high-salt conditions . The results of our study showed that MtCh509 is a salt-tolerant chitinase, as it maintained a high level of activity at NaCl concentrations of up to 1 M NaCl. At 1.5 M NaCl, activity decreased to 65%, and at 2 M NaCl, the residual activity was ~ 40%. Then, activity only slightly reduced in 5 M NaCl to 20% (Fig. 4). 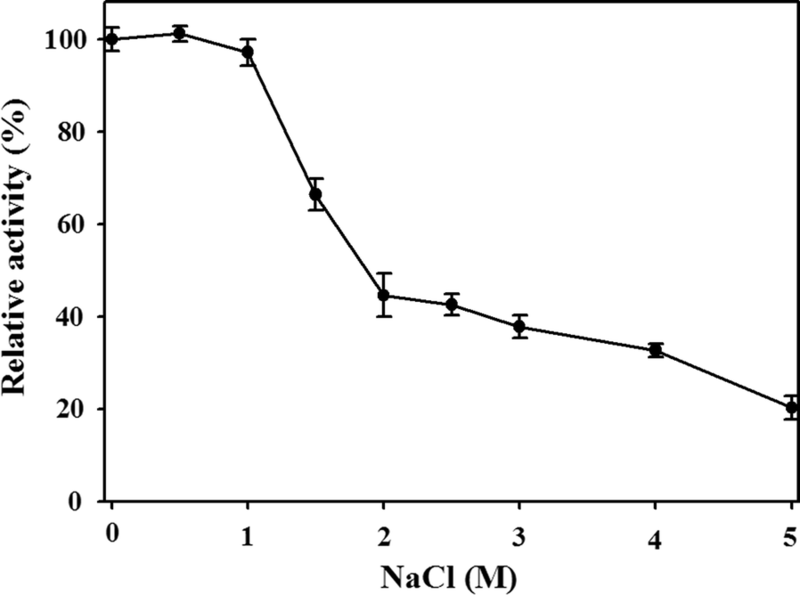 In comparison, a chitinase from Halobacterium salinarum CECT showed maximal activity at 1.5 M NaCl . Metal ions can affect enzyme complex formation, the maintenance/destruction of three-dimensional protein structure, and enzyme stability and activity . Hg2+ is known to be a major inhibitor of chitinase activity. It reacts with cysteine residues, specifically in –SH groups, and can change the tertiary structure of a protein . Hg2+ strongly reduced the activation of MtCh509, even at low concentrations (Table 1). Many bacterial chitinases, such as those of Bacillus sp. DAU101 , Penicillium ochrochloron MTCC 517 , and Pseudoalteromonas tunicata CCUG 44952T  were strongly inhibited by Hg2+. Cu2+ catalyzes the formation of intramolecular S–S bridges through auto-oxidation as well as the formation of sulfenic acid . Cu2+ (at 10 mM) decreased the activity of purified MtCh509. Similarly, a chitinase from Chitinibacter sp. GC72 was highly inhibited by Cu2+ . In contrast, another chitinase was observed to be stimulated by Cu2+, as the Asp and Glu in the chitinase active site binds 2+ ions . According to previous reports, Ca2+ generally increases the activity of chitinases from various bacteria, including Chitinibacter sp. GC72  and Bacillus sp. Hu1 . DTT promotes the destruction of S–S bridges in enzymes, and DTT moderately inhibited MtCh509 activity. This result is comparable to that reported for a chitinase from Bacillus licheniformis Mb-2 . EDTA binds to metal ions in solution and acts as a chelating agent, and this compound has been reported to reduce the activity of chitinases produced by Bacillus sp. and Streptomyces sp. .
Organic solvents are divided into two categories, non-polar solvents and polar solvents, which include both polar aprotic solvents and polar protic solvents. In our study, we tested the effects of various organic solvents on the chitinase activity of MtCh509, including acetone, butanol, DMSO, ethanol, isoamyl alcohol, isopropyl alcohol, methanol, hexane, benzene, toluene, and acetonitrile. Some organic solvents (acetone, ethanol, isopropyl alcohol, and acetonitrile) strongly inhibited chitinase activity, whereas others (DMSO, isoamyl alcohol, hexane, benzene, and toluene) enhanced enzyme activity (Table 2). The level of activation for purified MtCh509 was higher than that reported for other bacterial chitinases from A. hydrophila SBK1  and Streptomyces sp. . Most tested non-polar solvents enhanced the activity of purified MtCh509. These results suggest that hydrophobic interactions contribute to the activation of MtCh509 . To identify the best substrate for MtCh509, the chitinase activity of purified MtCh509 was assayed using different substrates (colloidal chitin, glycol chitin, CMC, and Avicel). The highest activity was observed when glycol chitin was used as a substrate. Compared to glycol chitin, colloidal chitin was hydrolyzed much less (~ 17%). However, the specific activity of purified MtCh509 with colloidal chitin as a substrate was higher than that reported for other chitinases [6, 67]. Very weak activity was observed when CMC was used as a substrate. Similar to ChiB from Aeromonas veronii B565, MtCh509 also did not hydrolyze CMC as a substrate , and no chitinase activity was detected in the presence of Avicel. Similarly, SmChiA did not bind to Avicel . The Km and Vmax values of MtCh509 for colloidal chitin were 9.275 mg/mL and 20.4 U/mg, respectively. The Km values of chitinases from other microorganisms were 12.62 mg/mL , 47.92 mg/mL for SmChiD of Serratia marcescens GPS5 , and 35.12 mg/mL for SpChiD of Serratia proteamaculans . MtCh509 showed a higher affinity toward colloidal chitin than the other tested substrates. The measured Vmax of MtCh509 is higher than that reported for several bacterial chitinases, including those from Pseudoalteromonas sp. DL-6 (13.51 U/mg) , Streptomyces violaceusniger (6.6 U/mg) , and Bacillus licheniformis SK-1 (7.03 U/mg) . Hydrolysates were analyzed from the reaction using colloidal chitin and NAG2-NAG6 chitooligosaccharides as substrates (Fig. 5). When colloidal chitin was used as the substrate (Figs. 5A, 6), NAG1-NAG3 appeared as products. The major product generated by MtCh509 (0.3 μg) was NAG2. Many bacterial chitinases have also produced similar results [1, 38, 54]. MtCh509 did not hydrolyze NAG2 (data not shown), suggesting that MtCh509 could not use NAG2 as a substrate. Similarly, Sp chitinases (Sp ChiA, Sp ChiB, and Sp ChiC) from Serratia proteamaculans 568  and FbalChil8A and MvarChi18A from Ferrimonas balearica and Microbulbifer variabilis  also could not use NAG2 as a substrate. NAG3 (Fig. 5B) was degraded by MtCh509 to NAG2 and NAG1 within 15 min. NAG4 (Fig. 5C) was degraded to NAG2, and NAG5 (Fig. 5D) was degraded to NAG3 and NAG2. NAG6 (Fig. 5E) was finally degraded to NAG3 and NAG2 with NAG4 observed as an intermediate product. Based on these results, we concluded that MtCh509 from M. thermotolerans DAU221 is a processive endochitinase. ChiA from Bacillus licheniformis DSM8785  and Sp chitinases (Sp ChiA, Sp ChiB, and Sp ChiC) from Serratia proteamaculans 568  showed similar hydrolysis patterns. In particular, when the levels of purified MtCh509 were high (0.6 μg), NAG4 was synthesized from NAG3, as a substrate (Fig. 5F). This result showed MtCh509 has transglycosylation activity. Under other reaction conditions, such as changing substrates, this result was not observed. Many bacterial transglycosylating chitinases have been reported, including ChiA and ChiB from Serratia marcescens , SpChiD from Serratia proteamaculans , StmChiA from Stenotrophomonas maltophilia , and VhChiA from Vibrio harveyi . In conclusion, an approximately 60 kDa chitinase from M. thermotolerans DAU221 (MtCh509) was heterologously expressed in E. coli and purified by His-tag affinity chromatography. The recombinant protein was stable under sub-acidic conditions and at high temperatures and was highly active in the presence of 1 M NaCl, tolerating up to 5 M NaCl. In addition, MtCh509 interacts with several non-polar organic solvents, presumably through hydrophobic interactions. MtCh509 shows specificity for colloidal chitin with crystalline polysaccharides. Based on amino acid sequence and TLC analyses, MtCh509 is an endochitinase. In addition, MtCh509 has transglycosylation activity and produces NAG4 from NAG3. Thus, MtCh509 can be used for various biotechnological applications. HYL carried out the experiments and drafted the manuscript; YSL designed the experiments and revised the manuscript. YLC proofed the manuscript. All authors read and approved the final manuscript.